Darn! – One minute you were on your feet, and the next you are staring up at the ceiling. You have done a quick check and all body parts seem to be moving and working fine. Since there’s no injury, you are hoping to avoid calling 911, but you can’t figure out how to get up – and of course you can’t spend the rest of your life on the floor, so what are the options? If this is a familiar scenario, and one that you have encountered on more than one occasion due to leg weakness or a neurological disorder, then investing money in equipment that will assist you to more easily get up from the floor may be worthwhile. There aren’t an extensive number of equipment solutions available for fall recovery, but there are at least a handful of good possibilities you can consider. Some of the pros and cons of these different options are discussed below. The first category of fall recovery equipment are step-based products. 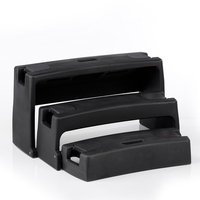 Both the Paraladder and the ResQup fall under this category and are designed to help you incrementally lift your bottom upwards from one step to the next in a seated position. Once you have ascended from the floor level to the top step of the equipment you can then slide backwards onto a bed, chair, or wheelchair. Step-based products are portable so they can be used anywhere inside the home, or even outside in the yard. You don’t need to have the strength to transition completely from the floor up to a chair seat in one big swoop; instead you can slowly ascend the stairs, resting as needed. Both products are easily transportable. If another person is available in the home with you they can retrieve it and bring it to you anywhere the fall occurs. Both products can also positively be used to help you safely lower yourself down to floor level for performing exercises, playing with children or gardening. You must have good upper body strength to use this kind of product. If you live in the home alone, the chance that you will be near the equipment when you fall is probably not likely; however, if you live in a studio or small home, you may have the ability to scoot over to it. The Paraladder has raised handles on either side of the steps, which can give you extra leverage in lifting your bottom up the stairs. The ResQup is designed with a shorter distance between each of the steps, making it easier for you to ascend the stairs if you have reduced arm strength. It has padding on the steps and rounded step edges, which will help prevent the skin from being sheared, as well as make it more comfortable if you want to use your elbows to assist in pulling yourself up the stairs. And, if you are a user who has the ability to walk, the ResQup has an additional feature, which the Paraladder does not. 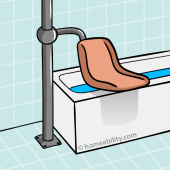 The two lower steps of the ResQup can be pushed backwards underneath the uppermost seat once you have moved your bottom up to the topmost step. This allows you the ability to position your feet firmly underneath yourself and to stand up directly from the equipment itself, which is helpful when you are not near a chair or bed to transition backwards onto. Both the Elk and Camel Lifts are air-inflatable devices. You simply roll, or move over onto the device when it is deflated, and at the push of a button it inflates and raises you up to a seated level. 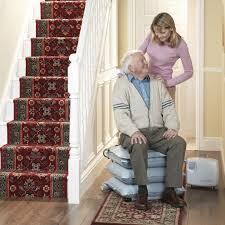 This type of product does all the physical lifting, reducing strain on you and your caregiver if one is involved. It is portable so a caregiver can easily retrieve it and bring it to you wherever the fall occurs. When deflated, this solution can be stored out of the way in a closet. The key difference between the Camel and the Elk is that the Camel has an air-inflated piece to support your back, which the Elk does not. The back support feature offered by the Camel provides increased support, making it possible for you to use this product independently. In contrast, if using the Elk you would need to have a second person present to assist you with sitting balance as it inflates. 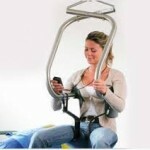 Mobile Patient Lifts and Ceiling Lifts are mechanical hoists that can be used to assist you up from the floor. To use this type, you merely need to roll over onto a cloth sling or fasten a harness around you and then with the push of a button the machine does all the work to lift you up. The Mobile-style Patient Lifts have wheels, which allow the equipment to be rolled in to different rooms. In contrast, Ceiling Lifts can typically only be used for assistance getting down to and up from the floor in the room where they are installed. This category of products are a good alternative if your arms are not strong enough to pull yourself up using a step-ladder type of product. Mobile Patient Lifts and Ceiling Lifts do all the lifting, which makes it easier on you and reduces physical strain on your caregiver if one is involved. 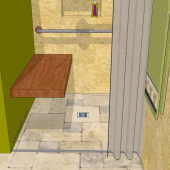 These lifts aren’t only good for fall recovery, but they can also be used to help you get to a chair, wheelchair, toilet, bed and some bathtubs. This type of equipment is not as easily transportable as the step ladders and air-cushions; therefore it does not offer as much versatility for responding to a fall in any location. [a] Many companies offer this style of lift. Product shown is by MoLift. 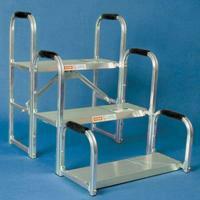 Also note that not all mobile lifts can be used for floor transfers so check with the manufacture prior to purchase. [b] Many companies offer this style of lift. Product shown is by Guardian. [c] Many companies offer this style of lift. Product shown is by SureHands. The Smart Lift is a special vest designed for allowing a caregiver to more safely assist you in getting up from the floor. 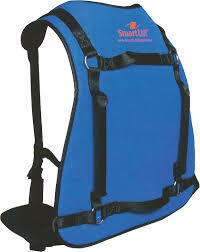 According to the product’s designer, a single caregiver may in some cases be able to assist you to stand up using the Smart Lift vest; however, having two people would be more ideal for the safety of all involved. We recommend you always seek advice from your physician or therapist about the appropriateness of a product for your needs, prior to purchase. 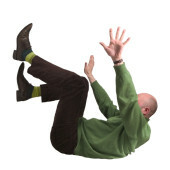 Thank you for your videos of “how to get up from a fall”. I am 66 years old, I have chronic progressive neuro behcet’s. I broke 4 PELVIC BONES in a ground level fall 3 years ago. One did not heal right. My doctor has not been able to figure out WHY, or how to treat it. 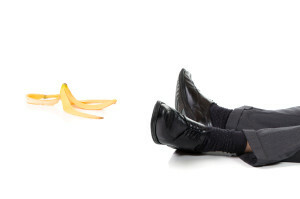 The doctor did not address – HOW TO GET UP FROM A FALL. AFTER I fall, (without hitting my head), I am “befuddled” for a number of minutes before I try to get up . I just lay there, my brain /body has to focus on how to get up. Not to long ago, I just bounced right back up, without thinking about it. I hope repeatedly watching your YouTube video a number of times, will stick in my memory, to help me get up. Thank you for addressing what many take for granted and don’t understand. Thank you making a vital, useful video! 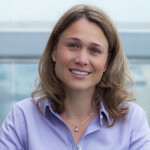 I have MS and now cannot get upl on my own. My wife is just not strong enough.. The inflatable option above is just to expensive. I have started experimenting with a car tyre inner tube and and a handheld battery car tyre inflator. My first attempt did not work but I think this idea has merit and I will persevere. Anyone else tried this? Or anything else? Thanks for this article. My husband is falling more and though I’m pretty strong, his ability to assist is diminishing. You’ve presented some options with pros and cons quite clearly! What we’ve used instead (which works very well) is a self inflating air bed mattress – one which comes quite high off the ground. This is enough to get mum off the ground and comfortable until she’s ready to be transferred into a chair, or has a comfy place for a rest in the meantime! I’ve often wondered how well an air mattress would work for this scenario and whether the air pump for an air mattress would be strong enough to lift someone while they were on top. I’m happy to finally learn the answer. Thanks for taking the time to share your experience and suggestion with others! Great idea & not too expensive! I’m going to buy a self inflating air mattress tomorrow. My mom fell this week & it took me 2 1/2 hours to get her up using a ramp she could inch her way up and into a chair. I don’t want to go through that again! I have seizures sometimes, which cause me to fall. My daughter has always been there to help me up, but she just began college this year & the rest of my kids live in other states so I’m alone in the house now. I have a lifeline, which I used when I fell last week, but I hate to call emergency every time I fall. The whole time I was waiting on the floor I kept thinking Ugh! I have become the lady from the commercial “I have fallen and I can’t get up” and figured there has to be another way than lying around waiting to have the emergency guys break down my door. 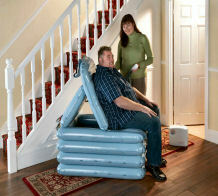 I really like the idea of the inflatable lift, but that just isn’t in my budget. I am going to give the Resqup thing a try first and see how that goes, but I am not certain I will have enough arm strength to pull myself up the stairs…fingers crossed. If you haven’t already, you might consider giving a trustworthy neighbor a spare key so that the emergency team doesn’t have to break down the door if you need help again in the future. Also, the holidays are almost upon us, so if you and your children have a tradition of exchanging gifts perhaps you can suggest that they put their money together with yours to help you buy one of the inflatable lifts – if you feel that will better meet your needs.